This article draws attention to some astrological aspects (i) in the natal chart of Friedrich Nietzsche (1844-1900), (ii) in a chart of his personal transits in January 1883, and (iii) in a synastry chart (for his relationship with Lou Salomé). These aspects are based on calculations using the tropical zodiac. (The sidereal zodiac gives almost, but not exactly, the same results.) Orbs are set as follows: 12° for conjunctions, 10° for oppositions, 8° for trines, 6° for squares and sextiles, and 3° for semisextiles and quincunxes; with those values divided by 3 for personal transits and synastry. Of note here (besides the almost-exact opposition of Sun and Pluto) is the Jupiter-Uranus conjunction (7°32') in opposition to Nietzsche's Mercury-Mars conjunction (6°13'), with the oppositions between Mercury and Uranus (0°36') and between Mars and Jupiter (1°54') being close to exact. The Mars-Mercury conjunction is, according to Richard Tarnas, "the archetypal synthesis of the warrior and the thinker, the warrior whose sword is his pen, his words, his ideas." 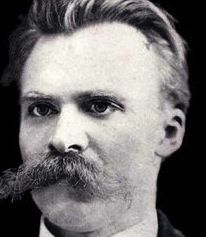 In January 1883, in the words of Richard Tarnas, "An explosion of creative power overtook him [Nietzsche], and Thus Spoke Zarathustra poured forth in an onrush of inspired clarity, pathos, and beauty." The transiting planets are shown along the top row and the natal planets in the left column. In the graphic below the transiting planets are white-on-black (retrograde planets are underlined), and the natal planets are blue-on-gray if retrograde or black-on-gray otherwise. 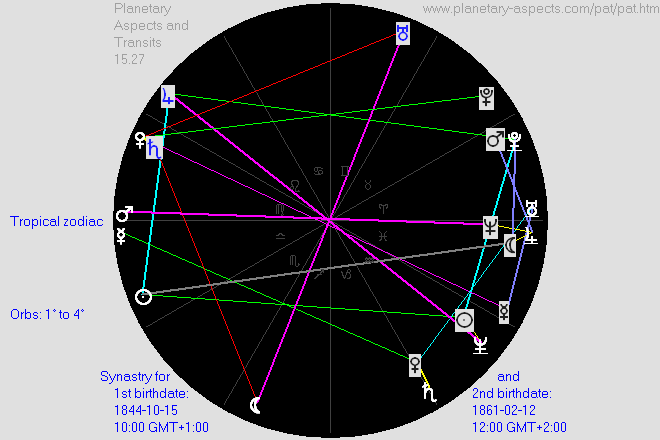 Since Mercury is the planet of thought and communication the inclusion of Mercury in one of the grand trines, the almost-exact (0°36') trine between transiting Mercury and natal Sun, and the almost-exact (0°29') conjunction beween transiting Mercury and natal Neptune, are particularly noteworthy. Richard Tarnas writes that "In the two years from January 1883 to January 1885, in coincidence with the once-in-a-lifetime personal transit of Uranus crossing his natal Jupiter-Uranus aspect ... Nietzsche composed the four parts of Zarathustra, as in a storm wind of freedom and power." The following image (obtained by double-clicking on the Uranus-Jupiter 'Opp' aspect in the table of natal aspects shown above, after first setting the orb for oppositions to 14°) illustrates the relative positions of transiting Uranus (dots) and natal Jupiter (central line) during the period mentioned by Tarnas. The true Uranus position is offset by 180° before the difference is calculated. The colored line shows the difference from exact opposition between transiting Uranus and natal Jupiter when the tropical zodiac is used, and the gray line shows the difference when the sidereal zodiac is used. Further information about Nietzsche's personal transits in January 1883 is given in the Showing All Transits for a Given Planet section and in the Grouped Transit Tables section of the user manual for our Your Planetary Transits software. From this image we can see that there were three exact oppositions in this period, and that (with the tropical zodiac) the middle one occurred close to midnight on March 17/18, 1884. The natal planets for the 1st birth date (Nietzsche) are shown along the top row and those for the 2nd birth date (Salomé) in the left column. In the graphic below Nietzsche's planets are white-on-black and those of Salomé are black-on-gray or blue-on-gray. Nietzsche's Venus forms four aspects with Salomé's planets, and with seven trines and sextiles and only one square (but that square is Nietzsche's Venus to her Uranus) this might seem an auspicious synastry. But on closer examination what leaps out here is the relations between Venus (the planet of love) and Saturn (the planet of restriction). His Venus is almost exactly (0°45') conjunct her Saturn, and her Venus is almost exactly conjunct (0°47') his Saturn. This does not suggest a successful amatory relationship. 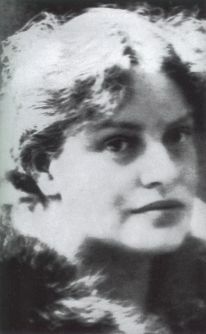 Nietzsche's natal Moon forms a square aspect (2°35') with his Venus, suggesting difficulties in his feelings toward women. Salomé's birth time is not known exactly, so the position of her natal Moon is also not known exactly, but in the synastry chart we find that Nietzsche's Moon and his Venus form an almost T-square with her Uranus.